Here is a piece I just completed for the Society of Gilder’s 20th Annual Conference at the Smithsonian Institution in Washington, D.C. 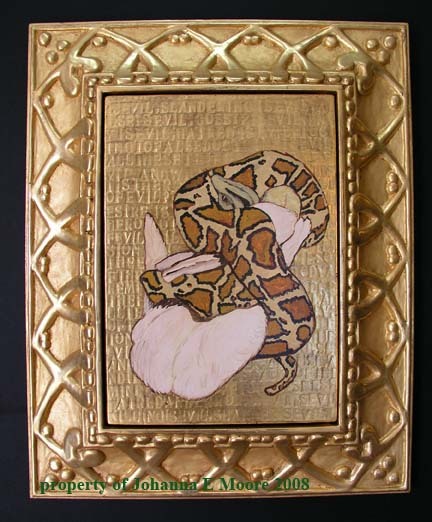 It is for the Exhibit hosted by Bill Adair at his Gold Leaf Studio entitled ” Masters of the Gilding Arts.” The title of the piece is “Defamation” and is a gessoed and gilded panel embossed with a quote from Buddha which defines what is evil in life. There is an egg tempera painting of a Boa killing a rabbit which I drew as inspiration for the entire piece from a photograph I found in the bottom of an aquarium once owned by my late friend Andrew Kimball Weegar. I completed the piece as an homage to him and as a way to continue the process of healing from his loss and from the effects of so much negativity in the world. The outer frame is hand carved in basswood by me, the artist, and is again water-gilded with 22kt gold leaf, burnished, and antiqued to give the whole piece an overall antique glow. For me this piece serves many purposes. In my life as a custom picture framer, and gilded object restorer, it is not often that I can make the time to work on my own creative endeavors, often ideas and sketches linger for years before being thrown away. I am so excited to have been able to complete this project to not only display my skills as a gilder to my fellow Society members and to the public at large, but to actually make the time to follow through on several ideas and to complete them with satisfaction. This is absolutely beautiful. You should be very proud of yourself. Your fellow framers in NYC are very impressed. Keep it up! Thank you so much for the positive feedback. I truly appreciate your comment and it means that much more to me coming from fellow framers!! !